Buddhists performed pilgrimages and other rituals at Borobudur until the temple was abandoned as many Javanese converted to Islam. The Temple of Borobudur or sometimes “Barabudur” is a Mahayana Buddhist temple located close to Muntilan on the island of Java in Indonesia. Built during the rule of the Sailendra Dynasty (c. 650-1025 CE), Borobudur remains the world’s largest Buddhist temple. The Buddhists among the Javanese population performed pilgrimages and other rituals at Borobudur until around the 14th and 15th centuries CE when the temple was abandoned as many Javanese converted to Islam. Rediscovered in 1814 CE, Borobudur has since then been the subject of immense research and archaeological investigations by the Dutch and Javanese. UNESCO designated Borobudur as a World Heritage Site in 1991 CE following a restoration in the 1970s and 1980s CE overseen by President Suharto (1967-1998 CE) and UNESCO, and the iconic temple continues to play a powerful role in shaping Indonesian aesthetics, architecture, and cultural identity. Borobudur is the most visited tourist site in Indonesia. Borobudur is located about 40 km (25 miles) to the northwest of Yogyakarta and some 86 km (53 miles) west of the city of Surakarta in central Java. The temple lies in an area between two volcanoes — Mt. Sundoro-Sumbing and Mt. Merbabu-Merapi — as well as two rivers — Progo and Elo. Borobudur is situated very close to two other Buddhist temples in the Kedu Plain: Pawon and Mendut. Scholars and archaeologists surmise that some sort of relationship must have existed between the temples as all three are positioned along a straight line. However, what this signifies is still a matter of scholarly debate. What is known is that the ancient and medieval Javanese, whether Hindu or Buddhist, associated the Kedu Plain with tremendous agricultural production, and it was thus considered one of the most sacred places on the island of Java. Ancient peoples regarded the two rivers as especially auspicious as they evoked the sacred Ganges and Yamuna rivers in what is present-day India. Not surprisingly, given the area’s favorability, the Hindu Gunung Wukir temple sanctuary, which dates to c. 732 CE, lies only 10 km (6 miles) west of Borobudur in the Kedu Plain too. The period in which the Javanese constructed Borobudur is shrouded in legend and mystery. No records pertaining to its construction or purpose exist, and dating the temple is based on artistic comparisons of reliefs and inscriptions found in Indonesia and elsewhere throughout Southeast Asia. Strong cultural and religious influenced arrived in what is now present-day Indonesia from the Indian subcontinent beginning around the 1st century CE. This influence grew rapidly from c. 400 CE onwards. Hindu and Buddhist merchants and traders settled in the region, intermarried with the local population, and facilitated long-distance trading relations between the indigenous Javanese and ancient India. Over the centuries, the Javanese blended the culture and religions of ancient India with their own. Modern historians have all disagreed amongst each other as to the political and cultural events that led to Borobudur’s construction as well. It is possible that the Hindu Sanjaya dynasty initially began construction of a Shivaite temple on the spot where Borobudur now sits around c. 775 CE and that they were unable to complete their temple as they were driven out of the area by the Sailendra dynasty. (It should be noted, however, that other Javanese historians see the Sailendra and Sanjaya dynasties as one and the same family and that religious patronage simply changed as a result of personal belief. The general consensus is that there were two rival dynasties supporting different faiths). Archaeological and scholarly consensus places the end of Borobudur’s construction around c. 800-825 CE. King Samaratungga (r. c. 790-835 CE?) is traditionally regarded as the Javanese king who oversaw the completion of Borobudur’s construction. Buddhist kings, like Samaratungga, were the rivals of the Hindu Sanjaya dynasty for power within the Mataram kingdom in central Java. The Hindu Javanese under the Sanjaya dynasty constructed Prambanan — Indonesia’s largest Hindu temple, located some 19 km (12 miles) to the west of Borobudur — in the same century as Borobudur, and it is entirely possible that Prambanan’s construction was a political and cultural response to that of Borobudur. What is known is that Buddhists made pilgrimages and took part in Buddhist rituals at Borobudur during the early medieval period until the temple was abandoned at some point during the 1400s CE. The root causes for the abandonment of Borobudur are moreover debated, and the reasons why the temple was ultimately abandoned remains unknown. 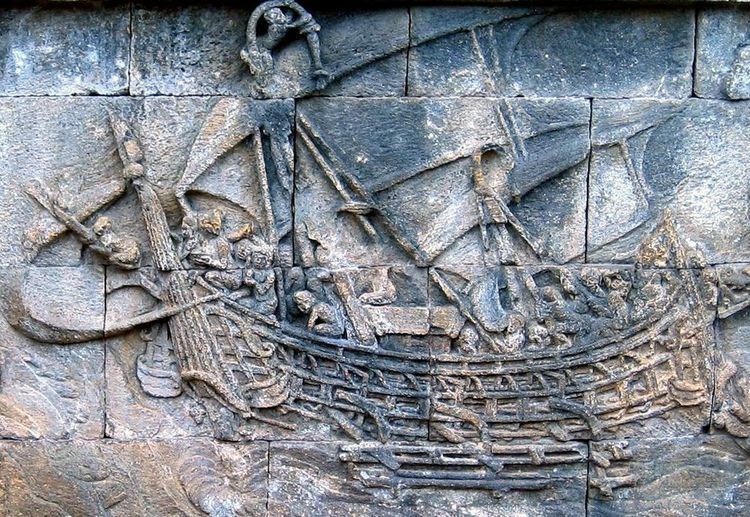 It is known that in the 10th or 11th century CE, the capital of the Mataram Kingdom moved eastwards away from Borobudur due to volcanic eruptions, which may have diminished Borobudur as a center of pilgrimage. Although Arab, Persian, and Gujarati traders brought Islam to what is present-day Indonesia as early as the 8th and 9th centuries CE, the acceleration of Javanese conversion to Islam began to increase rapidly only in the 15th century CE. 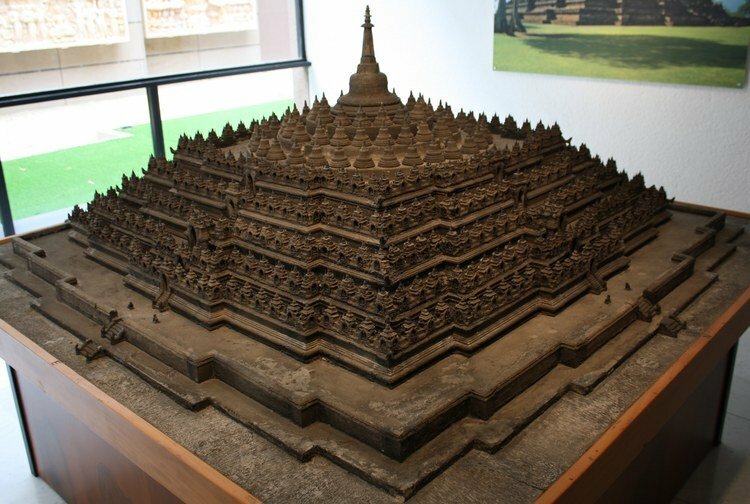 As the Javanese population accepted Islam en masse, it makes sense that Borobudur would lessen in importance. Over the following centuries, earthquakes, volcanic eruption, and rainforest growth hid Borobudur from the Javanese, rendering it inaccessible. There is evidence, nonetheless, that Borobudur never left the collective cultural consciousness of the Javanese people. Even after their conversion to Islam, later Javanese stories and myths expressed the temple’s association with mystery and negative energies. In 1814, the Lieutenant Governor-General Thomas Stamford Raffles (1781-1826 CE) who oversaw the brief British occupation of the Dutch East Indes permitted the Dutch explorer Hermann Cornelius (1774-1833 CE) to organize an expedition to find and locate Borobudur, which he did successfully the same year. In the years following Borobudur’s rediscovery, the government of the Dutch East Indies commissioned and permitted archaeological studies of the temple, but looting was a major problem in the 19th and early 20th century CE. Experts recommended that Borobudur be left in tact in situ, and the first restoration efforts lasted from 1907 to 1911 CE. Today, Borobudur is once again a site of Buddhist pilgrimage and a major tourist destination in Southeast Asia, but Indonesian officials remain worried about damage caused by the foot traffic at the temple, as well as lingering environmental and security issues. Borobudur is an impressive and monumental ancient Buddhist structure that can only be rivaled in Southeast Asia by Angkot Wat in Cambodia, the Buddhist temples of Bagan in Myanmar (Burma), the Hindu temples of Mỹ Sơn in Vietnam, and the ruins of Sukhothai in Thailand. Borobudur’s design is a mix of Javanese style and Gupta dynasty architecture, reflecting the blend of indigenous and Indian aesthetics in ancient Java. Over 500 statues of Buddha are positioned around Borobudur, and Borobudur contains roughly 3,000 bas-relief sculptures. These sculptures are all unique in that they depict the Buddha’s teachings, life, and personal wisdom. When taken altogether, Borobudur can claim to have the largest amount of Buddhist sculptures of any single site in the world today. It is known that in ancient times, sculptors decorated and adorned the temples’ various galleries before everything was covered with paint and stucco. This method has helped better preserve these sculptures for over a thousand years. It is estimated that over 1.6 million blocks of andesite — a volcanic rock — were used in Borobudur’s construction. These rocks were cut and joined in a method that did not employ any mortar. Borobudur is made up of three different monuments: the main temple at Borobudur and two smaller temples located to the east of the main temple. The two smaller temples are the Pawon Temple and the Mendut Temple, the latter of which contains a large sculpture of Buddha surrounded by two Bodhisattvas. Collectively, Borobudur, Pawon, and Mendut symbolize the path the individual takes in attaining Nirvana. All three temples lie in a straight line as well. Another Buddhist temple — Ngawen, which dates from the 8th century CE, is located just 10 km (6 miles) from the main temple at Borobudur. A ruined Hindu temple, the Banon Temple, lies just several meters north of Pawon. The main temple structure at Borobudur is constructed on three levels with a pyramid-shaped base replete with five square terraces, the trunk of a cone with three circular shaped platforms, and on the upper level, a grand monumental stupa. Fine reliefs form part of the walls of the temples and cover an area of approximately 2,520 m2 (27,125 square feet). 72 stupas each with a statue of the Buddha inside are found around Borobudur’s circular platforms. This allocation and delineation of space conforms to the Buddhist conception of the universe. In Buddhist cosmology, the universe is divided into three spheres known as arupadhatu, rupadhatu, and kamadhatu. Arupadhatu is here represented by the three platforms and large stupa, the rupadhatu is represented by the five terraces, and the kamadhatu is represented by the temple’s base. Brumann, Christoph and David Berliner (eds.). World Heritage on the Ground. (Berghahn Books, 2018). Dumarcay, Jacques. Borobudur. (Thames & Hudson Ltd, 1990). Fontein, Jan. The Sculpture of Indonesia. (Harry N Abrams Inc, 1990). Kahin, Audrey. Historical Dictionary of Indonesia. (Rowman & Littlefield Publishers, 2015). Miksic, John N. Borobudur: Golden Tales of the Buddhas. (Tuttle Publishing, 2017). Raffles, Thomas Stamford. The History of Java. (University of Michigan Library, 2009). Ricklefs, M. C. A History of Modern Indonesia Since c. 1200. (Stanford University Press, 2018). Soekmono, R. Ancient Indonesian Art of the Central and Eastern Javanese Periods. (Asia Society Inc, 1971). Originally published by the Ancient History Encyclopedia, 09.21.2018, under a Creative Commons: Attribution-NonCommercial-ShareAlike 3.0 Unported license. 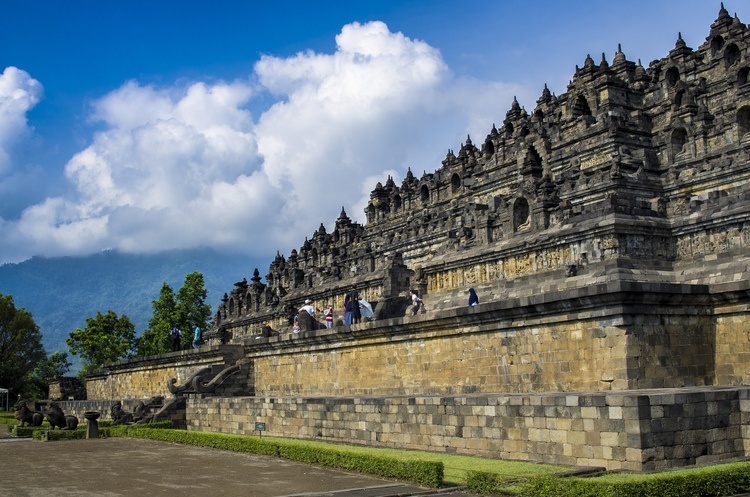 This entry was posted in Uncategorized and tagged Borobudur, Buddhism, History, Indonesia, Medieval, Middle Ages. Bookmark the permalink.